A stock trading simulator is a game-like program, typically online, in which players are given a fake brokerage account with an initial lump of simulated cash and are allowed to place simulated trades. Stock trading simulators leverage technology to recreate the trading experience, allowing users to buy and sell stocks in near real-time, build a portfolio, and gain or lose simulated money over time – all without any real money at risk. 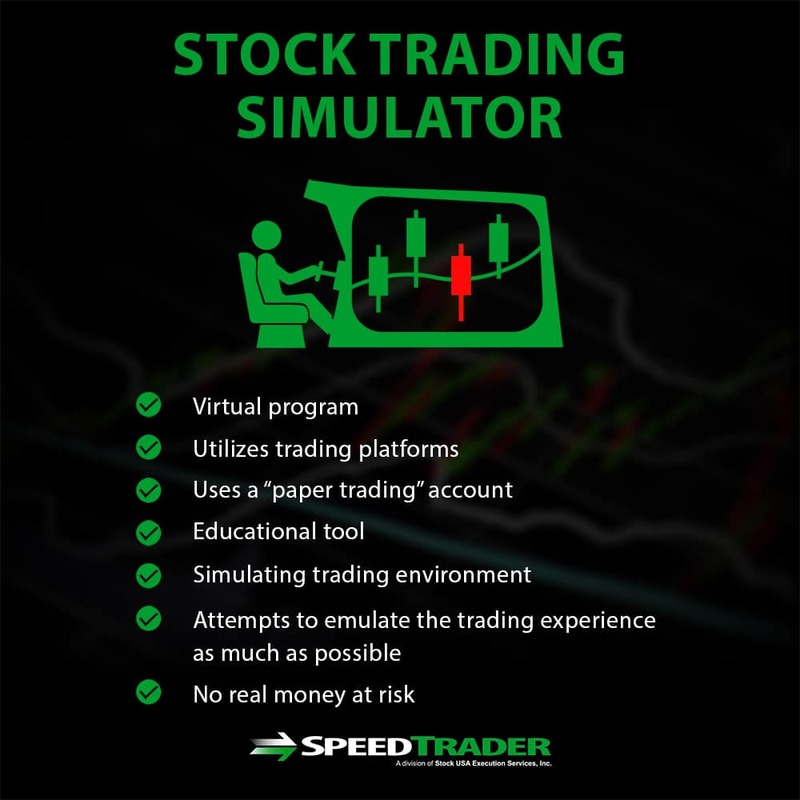 Trading simulators are similar to paper trading, as they allow traders to place mock trades for educational purposes. Simulators take things one step further by providing access to historical data, allowing traders to replay previous trading days with live emulations. 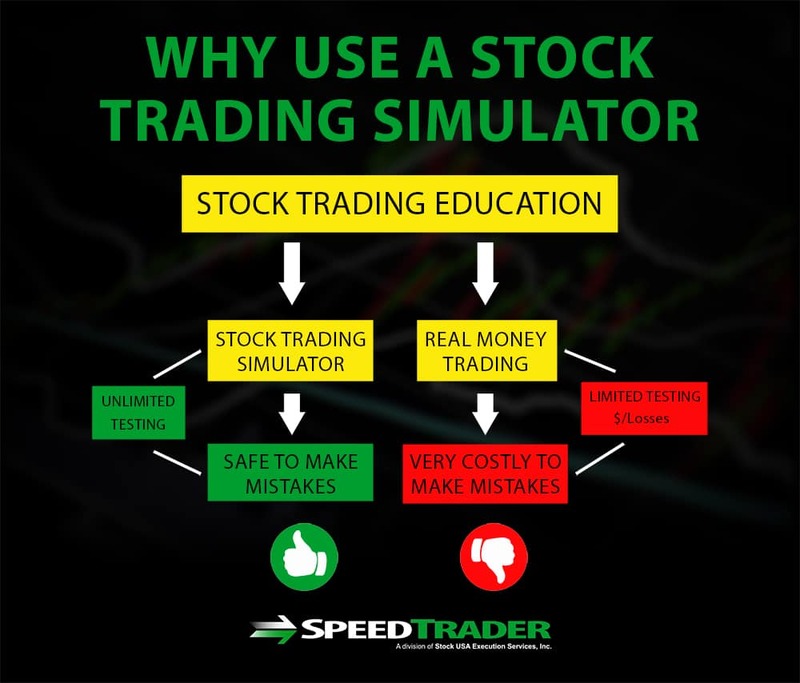 The primary purpose of stock trading simulators is education – they are designed to allow people to learn the basics of stock trading in an environment in which it is safe to make mistakes. Allowing people who are new to trading or long-term traders who are looking to begin day trading to play with fake money gives them a chance to learn how the market works, investigate technical indicators, research stocks, and make trading decisions without risking their own money. Although reading about stock trading and investing principles can be a useful start, a simulator allows new traders to move from theory into practice before committing to a strategy. Stock trading simulators can also be a useful way for day traders to try out new strategies, for example based on a new combination of technical indicators. Running a stock trading simulator based on new strategies allows a chance to ensure that they are profitable and can help identify any issues if they are not working as expected. One of the most important advantages of stock trading simulators is that they allow a risk-free environment around stock trading in which you do not have to lose real money while you are learning and making mistakes along the way. Without this inherent risk, it is easier to admit when a trade is bad and cut losing positions – something that many traders struggle with when using real money because of the emotions and stubbornness surrounding bad trades. Stock trading simulators also allow new traders to gain experience with the markets and with placing trades based on one or more strategies. Importantly, building a record of trades in this way allows users to gauge their performance over time and adjust if their strategy is unprofitable, as well as to identify strengths and weaknesses in different aspects of trading. The same lack of risk that gives stock trading simulators can also be a disadvantage in some ways. Without risk, there is no reward – any profit realized in the simulated portfolio is realized in simulated money. In addition, without risk, there is typically far less emotional connection to trades. For many traders, the transition from risk- and emotion-free trading in the simulator to real trading can lead to an unconscious shift in trading strategy and risk tolerance. Stock trading simulators can also diverge from real-world trading in some technical respects. 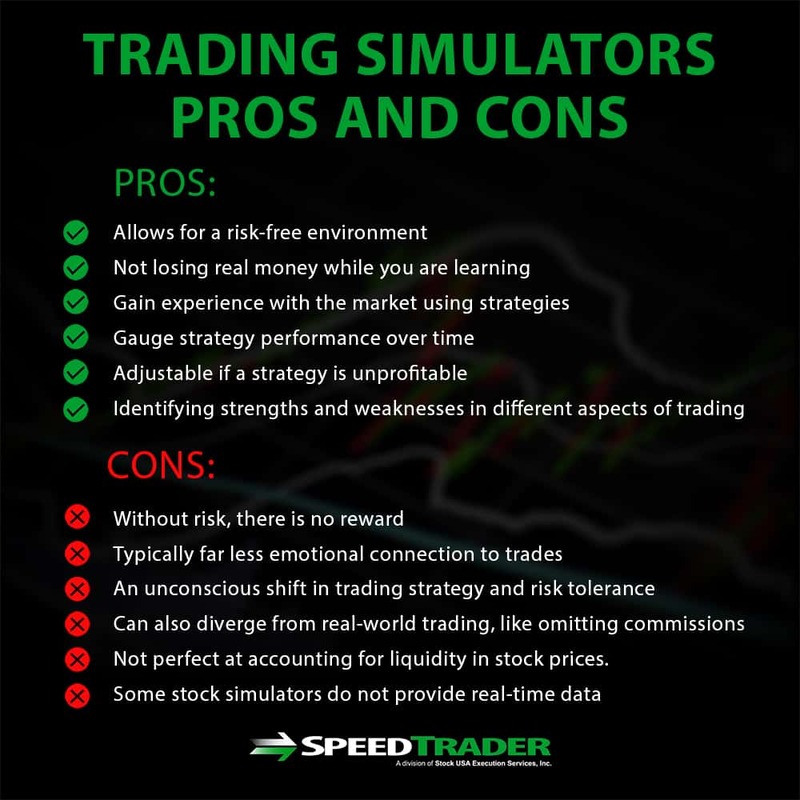 Many simulators do not account for brokerage commissions, meaning they undervalue the cost of placing trades in the real world. Simulators are also not perfect at accounting for liquidity in stock prices. For example, they may allow you to fulfill a trade at a specific price that would never have happened when trading through a real brokerage under the current market conditions. It should also be noted that some stock simulators do not provide real-time data. While this may be adequate for investors with mock portfolios, it’s a major hindrance for active traders. If you plan on using a simulator, make sure you have access to real-time data for the markets you will be trading. In order for a stock trading simulator to mimic real-world trading conditions, it is important to trade in the simulator in the same way you plan to trade with real money. This means trading with the same amount of simulated money as the amount of real money you expect to trade with and trading the same technical setups that you plan to trade when using real money. It also means accounting for the emotional aspects of trading with real money – essentially, acting as if you are trading real money in the simulator. Another important tip to keep in mind when using a stock trading simulator is to look for actionable takeaways that can be used to improve your trading in the real world. This requires tracking your trades and the results of your trades over time, as well as tracking the rationale that went into each trading decision. Identify trading setups that do and don’t work for you, as well as identify your personal strengths and weaknesses in trading. Keeping close track of these factors and actively improving your trading over time can better prepare you to make smart trading decisions in the real world. Stock trading simulators allow investors to learn trading, try new strategies, and identify personal strengths and weaknesses, all without risking real money. While there are some shortcomings to stock trading simulators – most notably the lack of an emotional connection to at-risk cash – on the whole they are powerful ways improve at trading in an environment in which it is safe to make mistakes and learn from them.